After their 2013 streaming-only release, Making Face, the band, fronted by Ross Brown (The Empty Spaces, solo work) seemed to go quiet. Until recently, that is. Rocketing out of retirement, Fullbloods brings us Mild West, an eleven-track, forty-minute album chock full of melodic Midwestern surf-rock via High Dive Records. This album marks a departure from their old sound, that funky yet smooth indie music. This album is much more experimental, adding more depth, new sounds, and creative hooks, Mild West is a new Fullbloods. Noodling their way into the first track, Money, Fullbloods fully embody that previously mentioned Midwestern surf rock. The kind of music that you expect to hear exuding from a garage on a 70-degree day in April. It’s punchy, it’s soulful, it’s ironically braggadocious, as much of the album turns out to be. 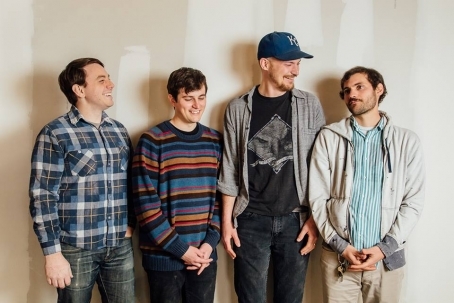 Altogether, Mild West offers up exactly what listeners expect from KC-based High Dive Records. An album that mixes perfectly on a playlist with Shy Boys, The ACB’s, Rev Gusto, and Empty Moon. The album carries a light-hearted vibe with self-deprecating lyrics. Clever and honest songwriting lends itself well to the feel of the album. Mild West is Fullbloods’ best album to date. Steven lives the agency life by day, and hustles music by night at The Record Machine. If he's not going to your show, he's probably playing frisbee with his dog or elbow deep in some chicken wings. Fullbloods celebrated the release of Mild West in KC over the weekend, and are starting a tour tonight in Minneapolis, Madison, Chicago, and Des Moines. They’ll be back in KC on St. Patrick’s Day at The Riot Room. Golden Sound Records will be hosting its third annual Crossroads Summer Block Party on June 6, at 19th and Wyandotte in the Crossroads Art District for First Friday. This year promises to be its biggest yet, with eight bands, as well as food trucks, live art, craft beer makers, and much more. If you haven’t heard of Golden Sound Records, it’s a Kansas City-based record label with a roster of talented local and regional bands—among them, The Empty Spaces, The Caves, and Baby Teardrops. But co-founder Jerad Tomasino doesn’t think of Golden Sound as a traditional record label. Tomasino started the label along with Shoare and Ross Brown in 2010. Since its inception, Golden Sound has not only helped bands release albums—it has helped showcase many musicians to audiences that might not otherwise be exposed to them. “Our process is creation-oriented, and we bring in super creative people in to flesh it out with their offerings,” says Tomasino. But without argument, music is the forefront of the annual Block Party. The lineup starts off with a swift kick in the teeth by Jorge Arana Trio at 6:30, followed by the sweet pop stylings of Rev Gusto and Mat Shoare. Katelyn Conroy’s solo indie project La Guerre follows, and power trio Loose Park and The ACBs will bring the rock ‘n roll. The night will be rounded out by the otherworldly sounds of Metatone and the atmospheric instrumental mutiny of Forrester. For Tomasino, one of the highlights of the Block Party is being able to put the performers on a large, professional stage in the middle of the Crossroads during First Friday. “You know your band’s music is good quality and worth putting on a big stage,” he says. “We want to take away the barriers and create a relaxed, fun environment for people to experience some amazing music,” Tomasino concludes. And Golden Sound is a collective, a label, whatever you want to call it, that does just that—facilitating contact between artist and audience, and at once helping increase the reach of Kansas City’s musical landscape. If you’re milling about First Friday next weekend, be sure to hit up the Block Party. It’s free! Facebook event page. 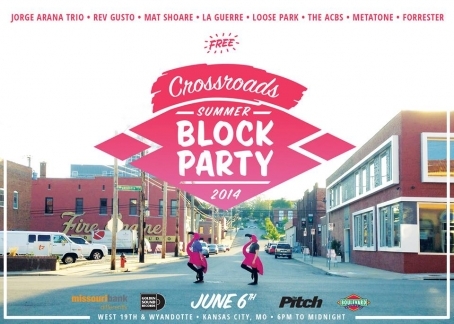 For more info on the Block Party, check out crossroadsblockparty.com. And be sure to check out the See Through Dresses’ release party at Mills. Show starts at 6:00 pm. The Author and the Illustrator will also play. Facebook event page. Michelle is editor of The Deli KC and is also a member of The Philistines, Drew Black & Dirty Electric, Dolls on Fire, and Lucky Graves. She’s a staff member of Midwest Music Foundation. She is getting tired of inserting all of these hyperlinks. It would seem that Golden Sound Records has done it again with the release of Ross Brown’s sophomore album Small Victories. And by “it” … I honestly couldn’t define what that would be. A wonderful X factor that every release on the label embodies; full of catchy indie hooks and masterful production. Taking quite the turn from his first album The Human Condition, Brown delves himself in an array of stylistic experiments. While The Human Condition emitted a consistent stream of indie riffs and beats, Small Victories changes styles with each track. From poppy synth sounds to music straight from the 1960s, Brown truly elicits his talents on this album. The album kicks off with the track “Dishes,” an erratic show of one’s own bravado. “I stand above everybody else, and I am glorious” sort of thing. Listening to the instrumentals, it is hard to imagine that only one man put this piece together. Synthesizers, guitars, and miscellaneous percussion push the upbeat song along. The next few songs seem to have a certain someone in mind; songs about memories and human interaction. The liner notes state, “None of these songs are about you.” I guess we will just have to believe that. “Laodicea” takes a somber tone as a song reveling in self-pity. Brown appears to pick out procrastination and a lack of skill sets as a personal downfall, exploring that part of him in the song. The sixth track, a personal favorite from the album, is a high-energy, synth-driven story of a song. You are almost forced to imagine the story unfolding in your head as Brown attempts to get to know a girl. Taking on the role of a fumbling, blabbering fool, Brown spews out lines like, “Did you ever eat paper as a kid?”, and “In a food crisis who among your friends would you eat first?” The tale of a poor kid trying to relate to a beautiful woman—an experience most men could identify with. Another thematic shift brings us to “Self Interest,” which discusses several cases of self-centeredness. The classic rock and roll diddy of this song urges the listener to wiggle a little. Tapping your feet to the beat, the song is very catchy. The hooks readily implant themselves in your brain and it’s nearly impossible to walk away from this track without humming it in your head. Being the frontman for Fullbloods, drummer of The Empty Spaces, and an operator of Golden Sound Records, Brown has his hands full. But despite all of that, he is able to put together Small Victories, a brilliant conglomeration of melancholy jams and upbeat anthems that is sure to win you over … pun intended. You can listen to some tracks from Small Victories by clicking on the album below. Steven is the intern of Midwest Music Foundation and The Deli - Kansas City. He can't go to 21+ shows yet and that bums him out. Ross Brown is a jack-of-all-trades in Kansas City music. First and foremost, he identifies himself as a songwriter, soon to be releasing his solo album Small Victories. He's also the beatkeeper of The Empty Spaces, frontman of Fullbloods, and an integral cog in Golden Sound Records. This week, we talk to Ross about all of his projects and find out what's coming up. Catch the beat right here! 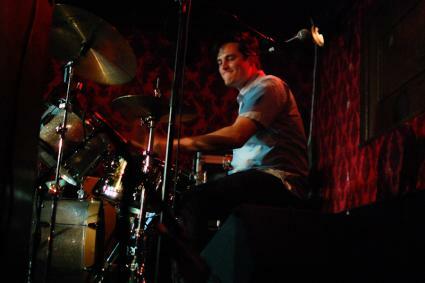 Ross Brown is a drummer, a songwriter, a guitarist, a singer. He splits his time as the bombastic timekeeper for The Empty Spaces, the frontman for Fullbloods, and he’s a solo artist with a new album on the way—his first since 2007. We sit down with him and find out more about his life as a drummer and all-around musician. Ross Brown: I started homeschooling my sophomore year of high school, which basically meant I blazed through my work and played music all day. The problem was that all of my friends were at school during the day, so I didn't have anyone to jam with. I borrowed an old kit from my buddy and started playing along with my own recordings to fill out the rhythm section. If that's not a pathetic story, I don't know what is. The Deli: Did you play drums first, or another instrument? Ross: I started with trumpet and euphonium as a kid and picked up guitar and bass along the way. Drums were the last addition. The Deli: What kind of kit do you use? Ross: I've had the same Gretsch Catalina Club kit for years. It's a decent and versatile enough kit to keep around. I love the 18" kick. I usually play a 14" brass Tama Starclassic snare and use Aquarian Modern Vintage heads on everything but the kick. I'm fortunate enough to have Fullbloods practice in my basement, so I get to hammer on the kits that Bill Pollock brings over. There was a span of time where I swear that guy was bringing a different kit every two weeks. His vintage Rogers kits are killer. 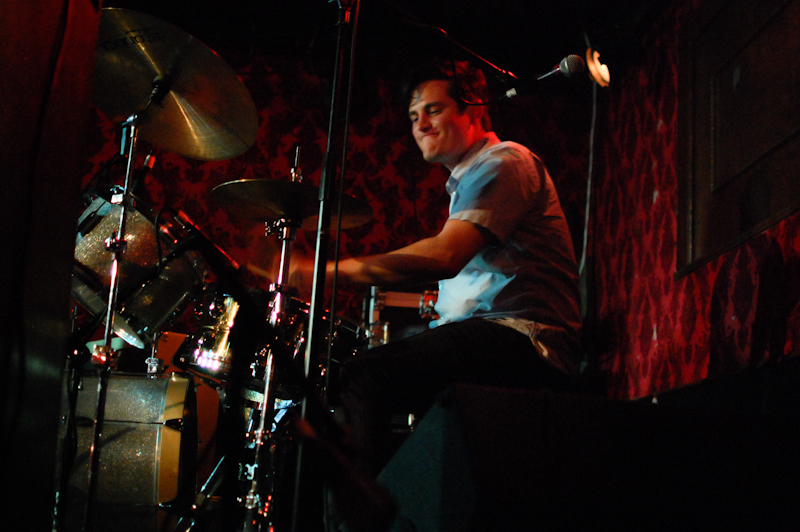 The Deli: When you think of your musical career, do you see yourself as a drummer? 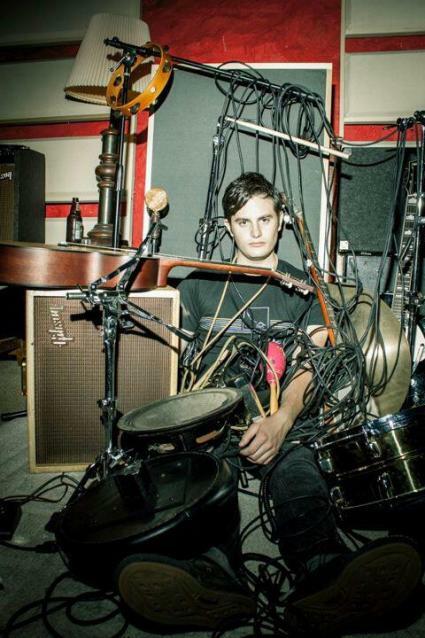 The Deli: Are there any local drummers you look up to? Ross: Kyle Rausch (of The ACB’s) is currently my favorite drummer in Kansas City. The Deli: You also are a solo artist and the frontman of Fullbloods. Do you think of yourself first as a songwriter or a drummer/instrumentalist? Ross: Songwriter. I think that helps me not go nuts and tromp over the rest of the band. Sometimes. The Deli: What’s coming up that you’re especially looking forward to? Ross: Officially releasing my solo album Small Victories on October 23 on Golden Sound Records. Really stoked that The Empty Spaces get to play with Broncho on Novermber 30 at Czar. The Deli: Finally, you’re a part of Golden Sound Records. Tell me a little bit about that collective and what role you play. Ross: We're a "record label" in that we help artists put out records, promote them, and sell them. Our main goal is to do cool stuff with music and the community and bring attention to music we think is great. I do a lot of the recording/mixing/mastering, web development, and design stuff. The next time you can catch Ross hitting the skins with The Empty Spaces will be this Saturday, October 20 at recordBar with The Cave Girls and Mad Spirits. Then, be sure to check him out with the band at this year’s Apocalypse Meow benefit at The Beaumont Club on Saturday, November 3. His solo album Small Victories will be available exclusively through Golden Sound Records as a digital download next Tuesday, October 23. Michelle is editor-in-chief of The Deli - Kansas City. She also has a weekly column with The Kansas City Star and reviews music for Ink. She plays with Deco Auto, Drew Black and Dirty Electric, and Dolls on Fire. She never ate glue in school, honest.